- I finally gave in; I have ordered an iPhone. My trusty Sony Ericsson k810i has served me well, but it was time to upgrade. I know I will check out Instagram. What else do you recommend? Fine dager! :) Instagram er utrolig gøy, og passer sikkert perfekt for deg som er så glad i å fange hverdagen. Det ser helt fantastisk ut med vår i Bergen. Can't wait to see you on instagram! Your garden looks perfect for BBQs! Oh wow what lovely things. I wish it was sunny here (England) I want to wear sunglasses and be outside all day too. 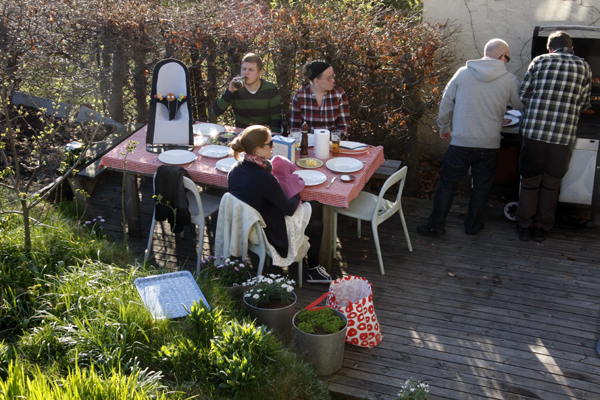 Love your 'potluck' bbq, great photo. You will love instgram but it is very, very addictive! !